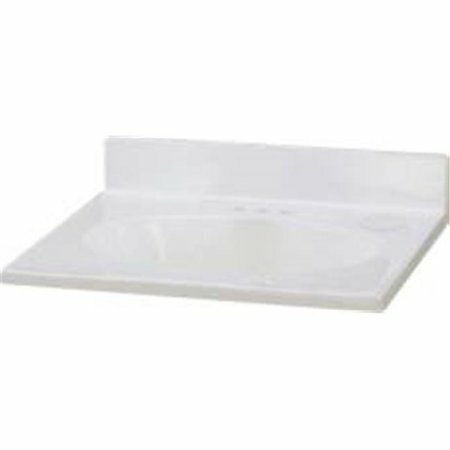 BATHROOM VANITY TOP WITH LEFT RECESSED BOWL, CULTURED MARBLE, SOLID WHITE, 22X37 IN. BATHROOM VANITY TOP WITH LEFT RECESSED BOWL, CULTURED MARBLE, SOLID WHITE, 22X37 IN. 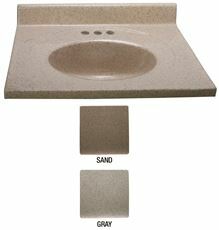 PREMIER� BATHROOM VANITY TOP, CULTURED GRANITE, SAND, 31 IN. X 22 IN. PREMIER� BATHROOM VANITY TOP, CULTURED GRANITE, SAND, 31 IN. X 22 IN. 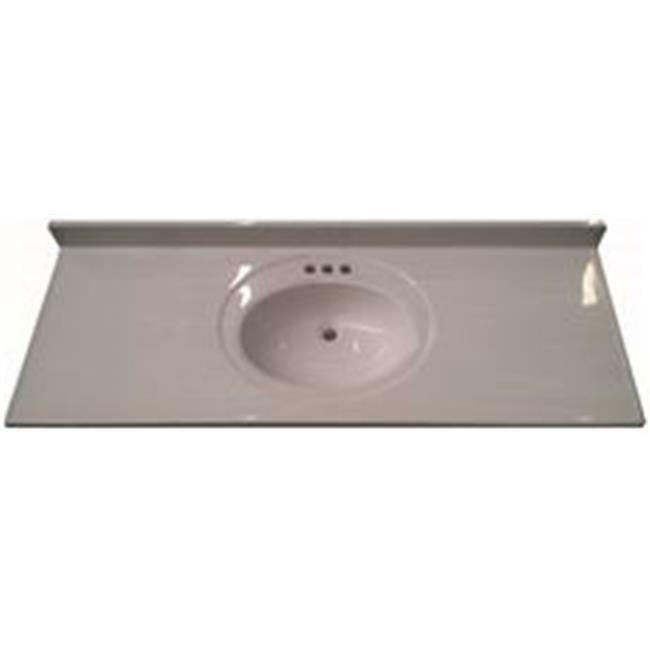 The Design House 551242 Single Bowl Marble Vanity Top features a classic white finish and the vanity bowl has a 5-inch depth and (3) pre-drilled holes for a 4-inch center mount. The cultured marble is stain resistant and measures 19-inches long by 17-inches wide. The 3-inch high back splash prevents mold and water damage and creates a physical barrier between your wall and vanity. Additional side splashes can be purchased separately. The built-in overflow keeps water in the bowl. 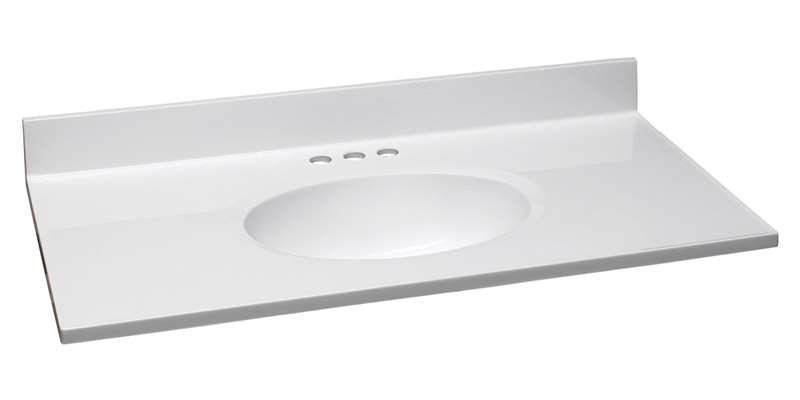 The vanity is UPC, CSA and ANSI Z124.3 compliant. The Design House 551242 Single Bowl Marble Vanity Top has a 1-year limited warranty that protects against defects in materials and workmanship. 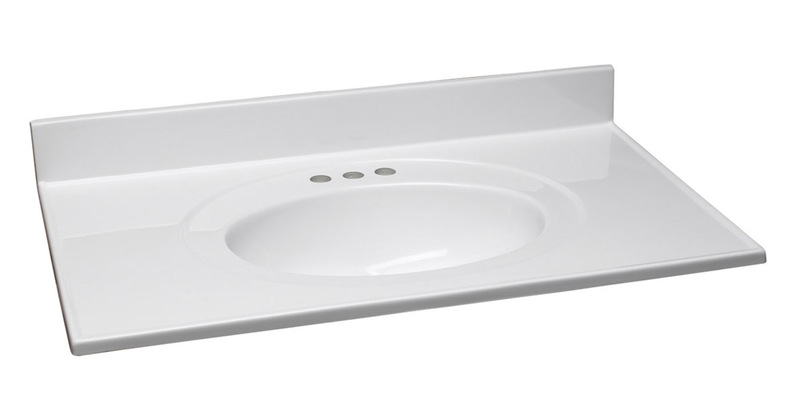 The Design House 553321 Double Bowl Marble Vanity Top features a classic white finish. 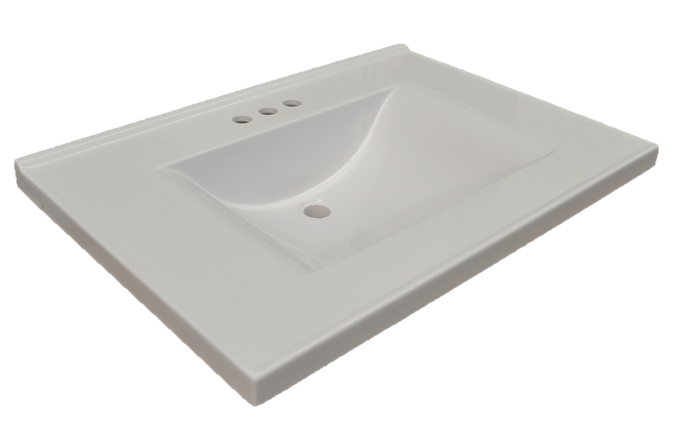 This product's high quality durable, and traditional styling makes it a perfect vanity top for any bathroom decor. 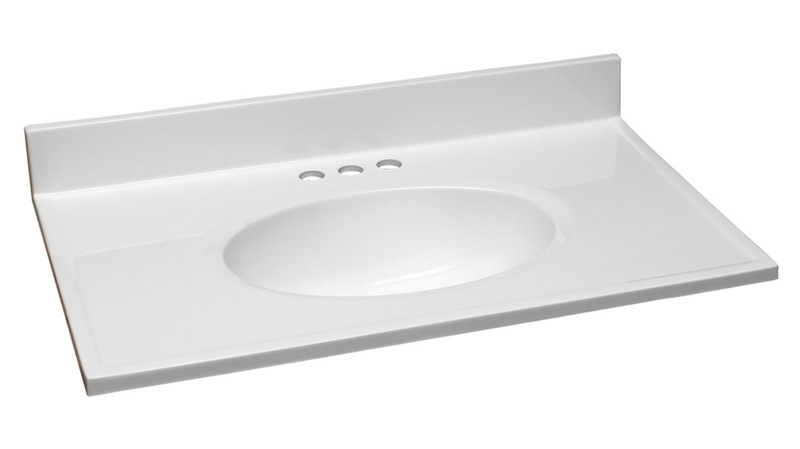 The vanity bowls have a 5-inch depth and (3) pre-drilled holes for a 4-inch center mount. The cultured marble is stain resistant and measures 73-inches long by 22-inches wide. The back splash prevents mold and water damage by creating a physical barrier between your wall and vanity, which defends against chemicals and water. Additional side splashes can be purchased separately. The vanity has a drip free edge that's slightly lifted to contain excess water. The vanity is compliant to CSA, cUPC and ANSI requirements, ensuring the highest quality. The Design House 553321 Double Bowl Marble Vanity Top has a 5-year limited warranty that protects against defects in materials and workmanship. PREMIER� BATHROOM VANITY TOP, CULTURED MARBLE, WHITE, 25 IN. X 22 IN. PREMIER� BATHROOM VANITY TOP, CULTURED MARBLE, WHITE, 25 IN. X 22 IN. PREMIER� BATHROOM VANITY TOP, CULTURED GRANITE, SAND, 25 IN. X 19 IN. PREMIER� BATHROOM VANITY TOP, CULTURED GRANITE, SAND, 25 IN. X 19 IN. PREMIER� VANITY TOP, CULTURED MARBLE, WHITE SWIRL, 49 IN. X 22 IN. PREMIER� VANITY TOP, CULTURED MARBLE, WHITE SWIRL, 49 IN. X 22 IN. 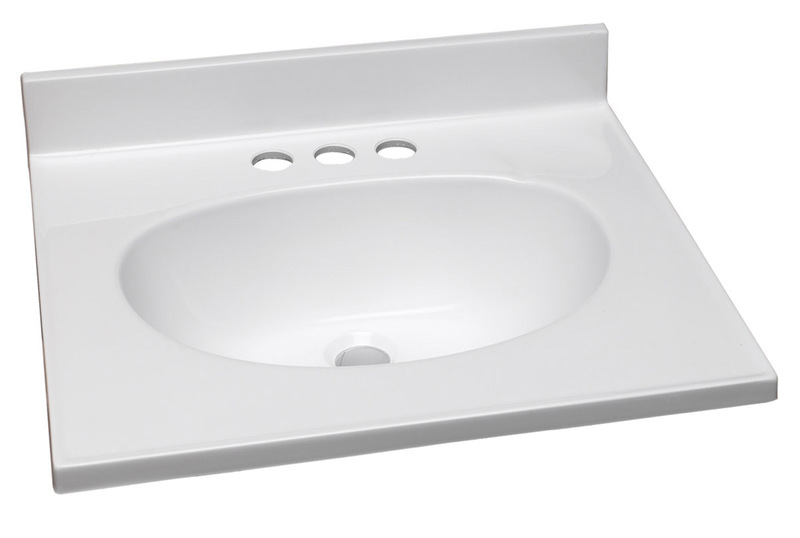 BATHROOM VANITY TOP WITH SINGLE RECESSED BOWL, CULTURED MARBLE, SOLID WHITE, 22X61 IN. 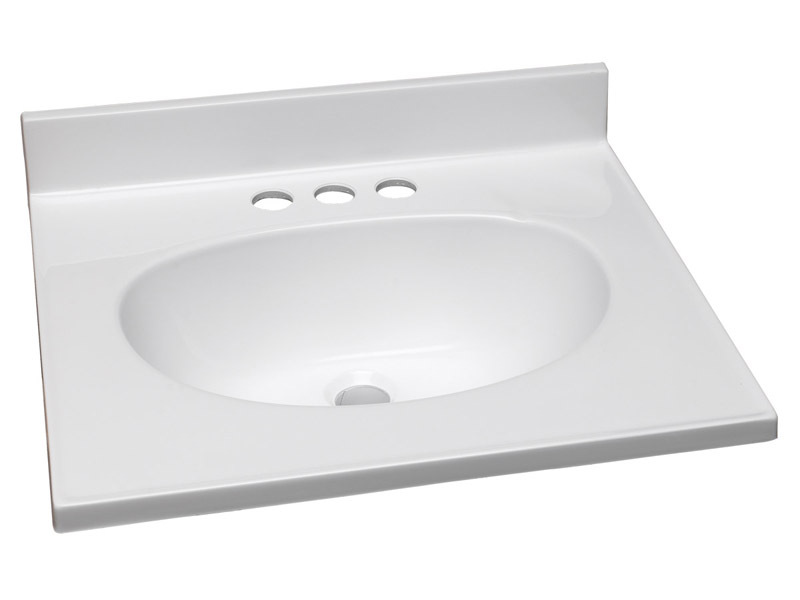 BATHROOM VANITY TOP WITH SINGLE RECESSED BOWL, CULTURED MARBLE, SOLID WHITE, 22X61 IN. BATHROOM VANITY TOP WITH DOUBLE RECESSED BOWL, CULTURED MARBLE, WHITE, 22X61 IN. BATHROOM VANITY TOP WITH DOUBLE RECESSED BOWL, CULTURED MARBLE, WHITE, 22X61 IN. 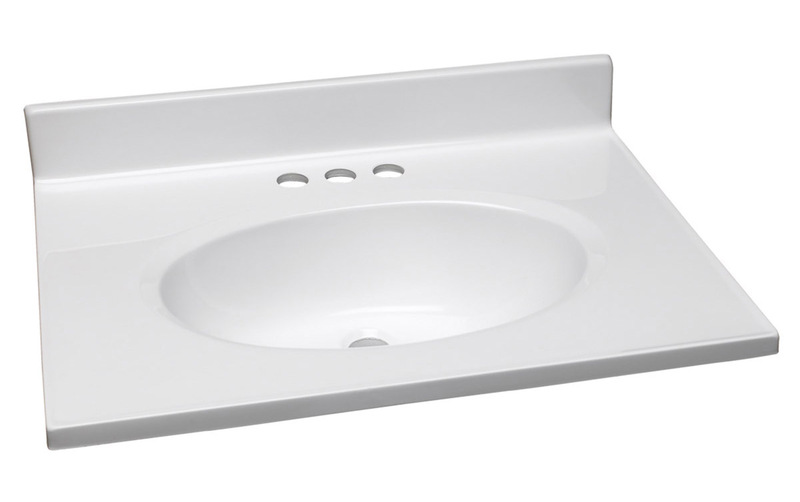 The Design House 553941 Contempo Vanity Top gives your vanity a stylish, clean-cut look that is sure to complement the rest of your dTcor. 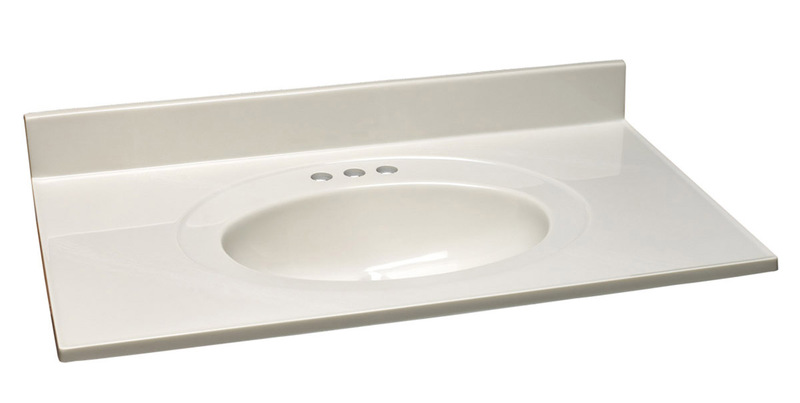 This vanity top measures 31-inches long by 22-inches wide, and is solid white. There are 3 pre-drilled holes, allowing for a 4-inch center mount faucet. The drip-free edge is lifted to contain excess water, preventing messes. The Design House 553941 Contempo Vanity Top comes with a 5-year limited warranty, so you can be confident in the quality of your vanity top. PREMIER� BATHROOM VANITY TOP, CULTURED GRANITE, SAND, 49 IN. X22 IN. 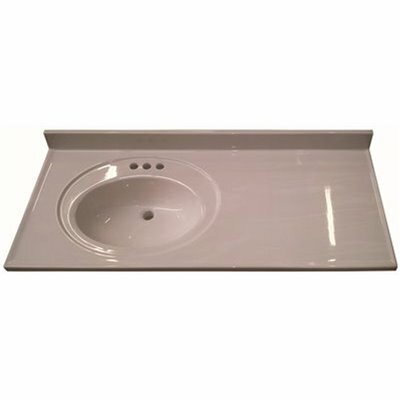 PREMIER� BATHROOM VANITY TOP, CULTURED GRANITE, SAND, 49 IN. X22 IN. The Design House cultured marble vanity top with 4-Inch backsplash gives your bathroom a stylish, versatile look. 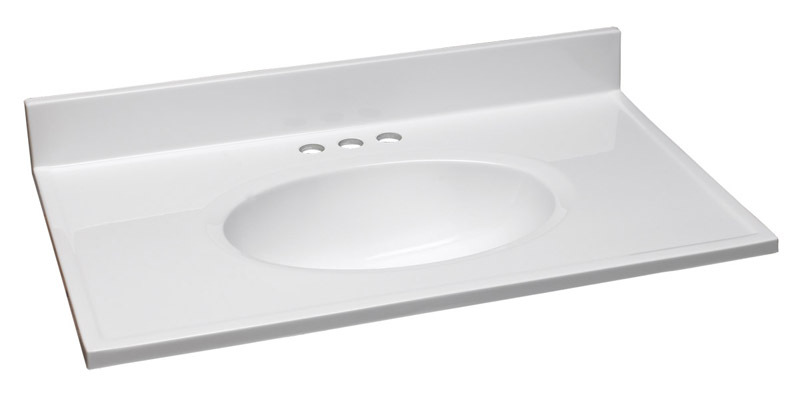 This vanity top measures 73 inches long by 22 inches wide, and comes in solid white that is sure to complement the rest of your bathroom décor. There are 3 pre-drilled holes, allowing for an 8" widespread mount faucet. The backsplash helps prevent mold and water damage. The Design House vanity top comes with a 5-year limited warranty, so you can be confident in the quality of your vanity top. Design House offers products in multiple home decor categories including lighting, ceiling fans, hardware and Plumbing products. With years of hands-on experience, Design House understands every aspect of the home decor industry, and devotes itself to providing quality products across the home decor spectrum. Providing value to their customers, Design House uses industry leading merchandising solutions and innovative programs. Design House is committed to providing high quality products for your home improvement projects. This back splash is a perfect compliment to a matching vanity top. It will help prevents mold and water damage for a long lived vanity top. Design House offers products in multiple home decor categories including lighting, ceiling fans, hardware and Plumbing products. With years of hands-on experience, Design House understands every aspect of the home decor industry, and devotes itself to providing quality products across the home decor spectrum. Providing value to their customers, Design House uses industry leading merchandising solutions and innovative programs. Design House is committed to providing high quality products for your home improvement projects. PREMIER� CULTURED MARBLE VANITY TOP, WHITE, 31 IN. X 22 IN. PREMIER� CULTURED MARBLE VANITY TOP, WHITE, 31 IN. X 22 IN. 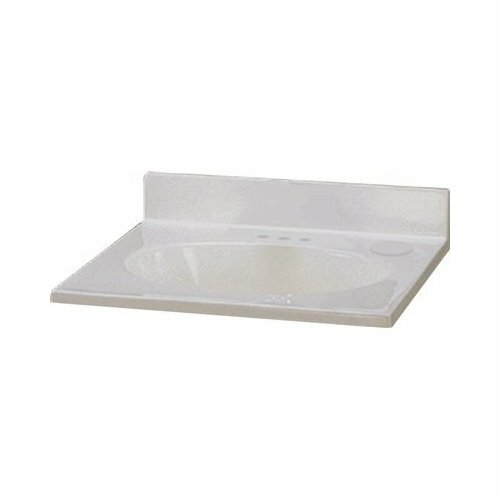 The Design House 551390 Single Bowl Marble Vanity Top features a classic white finish and the vanity bowl has a 5-inch depth and (3) pre-drilled holes for a 4-inch center mount. The cultured marble is stain resistant and measures 49-inches long by 22-inches wide. The 3-inch high back splash prevents mold and water damage by creating a physical barrier between your wall and vanity, which defends against chemicals and water. Additional side splashes can be purchased separately. The vanity has a drip free edge that's slightly lifted to contain excess water. The vanity is compliant to CSA, cUPC and ANSI requirements, ensuring the highest quality. The Design House 551390 Single Bowl Marble Vanity Top has a 5-year limited warranty that protects against defects in materials and workmanship. Design House offers products in multiple home decor categories including lighting, ceiling fans, hardware and plumbing products. With years of hands-on experience, Design House understands every aspect of the home decor industry, and devotes itself to providing quality products across the home decor spectrum. Providing value to their customers, Design House uses industry leading merchandising solutions and innovative programs. Design House is committed to providing high quality products for your home improvement projects. PREMIER� BATHROOM VANITY TOP, CULTURED MARBLE, WHITE, 37 IN. X 22 IN. PREMIER� BATHROOM VANITY TOP, CULTURED MARBLE, WHITE, 37 IN. X 22 IN. PREMIER� BATHROOM VANITY TOP, CULTURED MARBLE, WHITE, 25 IN. X19 IN. PREMIER� BATHROOM VANITY TOP, CULTURED MARBLE, WHITE, 25 IN. X19 IN. PREMIER� CULTURED MARBLE VANITY TOP, WHITE SWIRL, 31 IN. X 22 IN. PREMIER� CULTURED MARBLE VANITY TOP, WHITE SWIRL, 31 IN. X 22 IN. 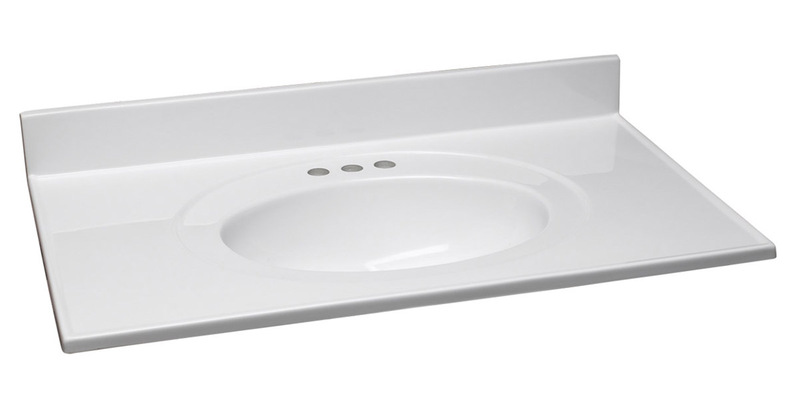 The Design House 553313 Double Bowl Marble Vanity Top features a classic white finish. 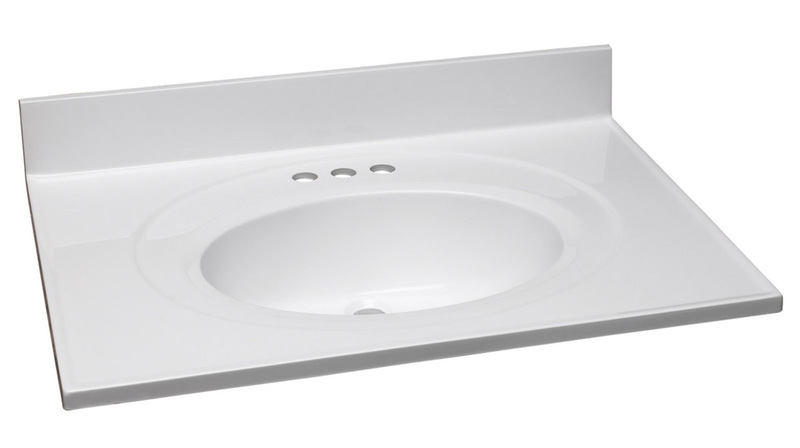 The vanity bowls have a 5-inch depth and feature (3) pre-drilled holes for a 4-inch center mount. The cultured marble is stain resistant and measures 61-inches long by 22-inches wide. The back splash prevents mold and water damage by creating a physical barrier between your wall and vanity, which defends against chemicals and water. Additional side splashes can be purchased separately. The vanity has a drip free edge that's slightly lifted to contain excess water. The vanity is compliant to CSA, cUPC and ANSI requirements, ensuring the highest quality. The Design House 553313 Double Bowl Marble Vanity Top has a 5-year limited warranty that protects against defects in materials and workmanship. PREMIER� VANITY TOP CULTURED MARBLE, WHITE SWIRL, 25 IN. X 22 IN. PREMIER� VANITY TOP CULTURED MARBLE, WHITE SWIRL, 25 IN. X 22 IN.